PET is globally recognized as safe, recyclable packaging, thermoplastic polymer, commonly used in beverage and food industries. It is a transparent, light-weight, strong, safe, shatterproof and recyclable packaging material with an inherent barrier used for wide range of product applications. The purpose of study is to assess the shelf-life of silver nanocoated (Glycyrrhiz aglabra) PET bottles of tomato puree for a period of ten days against enteropathogenic bacteria such as E. coli (MTCC40), Salmonella enteric (MTCC3219) and Shigella dysenteriae (PSGIMS & R). 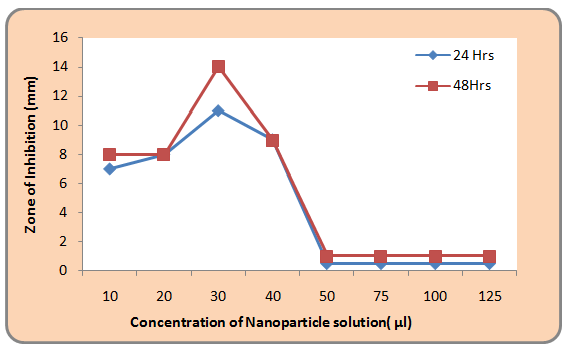 The maximum inhibition of antimicrobial activity of silver nanoparticle coated PET bottles of tomato from 0th day to 10th day, showed that 56.83 percentage against E. coli (MTCC 40), 67.67 and 87.67 percentage against Salmonella enteric (MTCC 3219) & Shigella dysenteriae (PSGIMS & R) respectively. Hence, different food packages can be tried out with coatings of silver-nanoparticles which could improve the shelf-life and antimicrobial property of food packages. The global production of plastics would reach about 227MT by 2015, with a growth rate increase of about five percent per year. PET is thermoplastic polyester widely used for production of beverage bottles. Plastic bottles made from polyethylene terephthalate (PET) are increasingly used in storage of beverages like softdrinks, mineral water, juices and beer, in comparison to other packaging plastic.PET is considered to be the most inert of polymers with good barrier properties against moisture, oxygen and carbon dioxide with a low migration tendency of its constituents . According to National Association for PET Container Resources (NAPCOR, 2011), among 5,478 million pounds of PET bottles are available for recycling . Different technologies can further enhance PET inherent barrier properties and offer great protection to natural properties of packaged products against oxygen migration and carbon dioxide. Food packed into PET containers is the main source of microorganisms causing diarrheal diseases [3,4]. Hence technology to minimize microbial health hazards is the need of the hour. Therefore barrier enhanced technology such as nanoparticle coatings on PET bottles was tried out in this study. Fresh medicinal plants Glycyrrhiz aglabra were collected from Annaikatti Hills and were certified by Botanical Survey of India, Coimbatore. For the preparation of extract, 10 g of the plant powder was added to 100 ml sterile distilled water in a 250 ml Erlenmeyer flask and boiled for 5 mins. The boiled extract was filtered using three whatmann filter paper No.1. Further, the plant extract was subjected for synthesis of encapsulated silver nanoparticles. The prepared medicinal plant extract of Glycyrrhiz aglabra was then centrifuged through GLC (1000 rpm for 45 minutes) and then added with 1 mM AgNO3. Further, the filtrate was centrifuged through ultracentrifuge for 1 hr 10 minutes. The nanoparticle solution was used for coating PET bottles. Fresh tomatoes (Solanum lycopersicum) were boiled with ½ cup sugar and 1 tablespoon of salt. The puree was then stored in 100 ml PET containers (with and without nanocoat). The PET bottles were punched out into disc size for performing agar well diffusion method for determining the highest activity among the different concentration of nanoparticles. 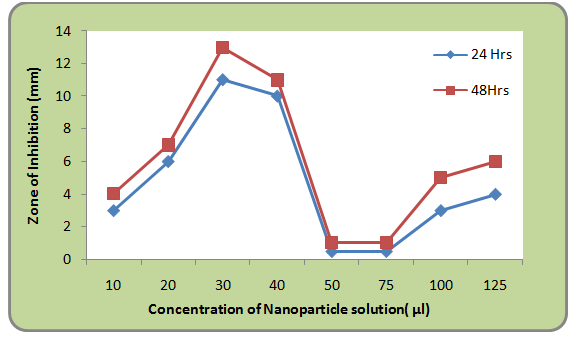 The antimicrobial activity of synthesized silver nanoparticles was done by the agar diffusion method. 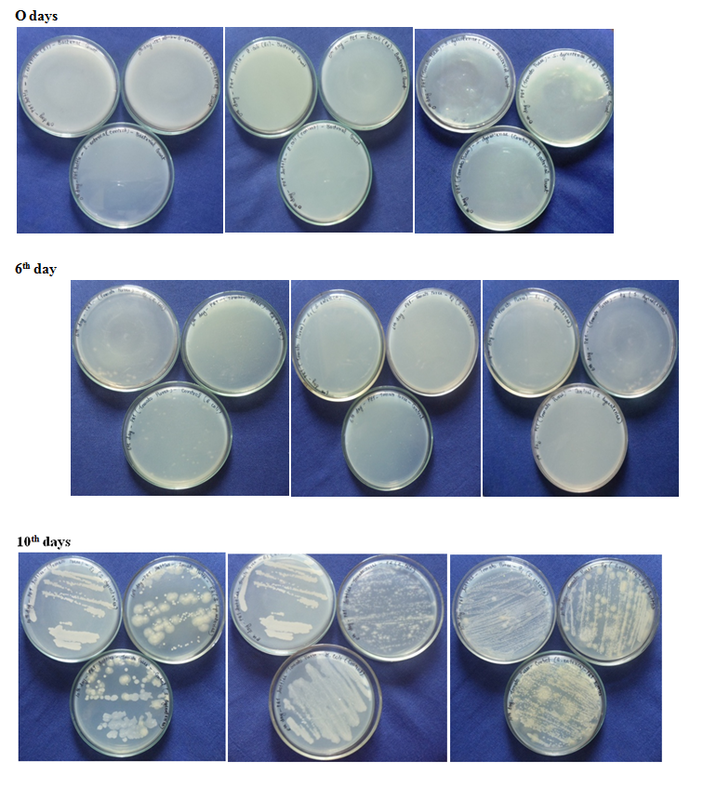 The log phase cultures were spread over the Nutrient agar medium plates using a sterile cotton swab in order to get a uniform microbial growth on test plates. Then approximately four wells of uniform sizes (0.65 cm) were made with a cork-borer, tested with nanoparticle solution at 10 μl, 20 μl, 30 μl, 40 μl and other petri plate tested with 50 μl, 75 μl, 100 μl and 125 μl of the encapsulated silver colloids were pipetted directly into the well against the test organisms of E.coli (MTCC-40), Salmonella enteric (MTCC 3219) and Shigella dysenteriae (PSGIMS & R). The plates were were incubated at 37°C for 24-48 hours. Further, PET bottles were made sterile under UV light, by swab method highest activity of freshly prepared nanoparticle solution were coated by swabbing and dried under the Laminar flow chamber for 40 minutes. After drying, the PET bottles were packed with tomato puree and inoculated with the test organism (in duplicates) E. coli (MTCC-40), Salmonella enteric (MTCC3219), Shigella dysenteriae (PSGIMS & R) and control (without nanocoating), tested for storage period of 10 days. For every two days interval, the sample was tested for enumeration of microbes. Figures 1A, 1B and 1C present microbial activity of the three microbes against different concentrations of nanocoats. IA, IB and IC by Agar well diffusion method, with nanoparticle solution at 10 μl, 20 μl, 30 μl ,40 μl, 50 μl, 75 μl, 100 μl and 125 μl of the silver colloids tested against E.coli (MTCC 40), Salmonella enteric (MTCC3219) and Shigella dysenteriae (PSGIMS & R) showed that 30 μl had a maximum zone of inhibition. Hence, 30 μl was selected for coating the PET bottles. 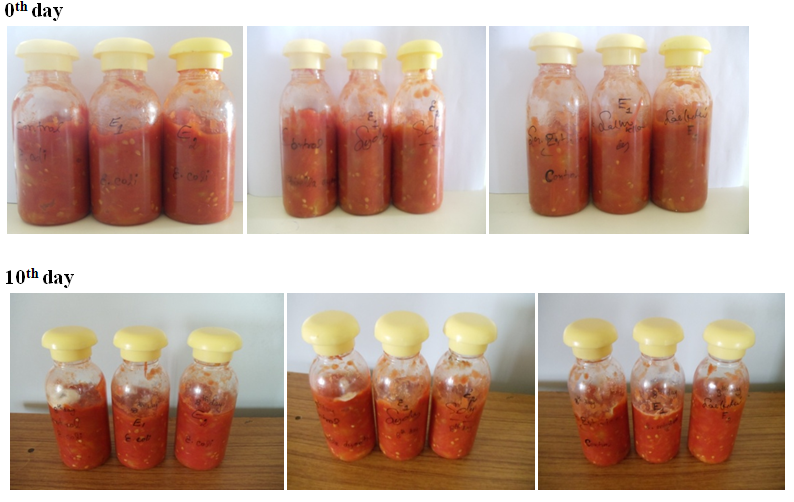 Figure 2 and 3, shown the Shelf-life Study of tomato puree for PET bottles is taken for a period of ten days. The enumeration of bacteria was done periodically once in every two days. It was found that 0th day to 6th day there was no difference in microbial growth of all three species. But 0th day to 10th day nanoparticle coated showed that 56.83% difference against E. coli (MTCC40), 67.67 and 87.67% against S. enterica (MTCC 3219) & S. dysenteriae (PSGIMSR) respectively (Table 2). 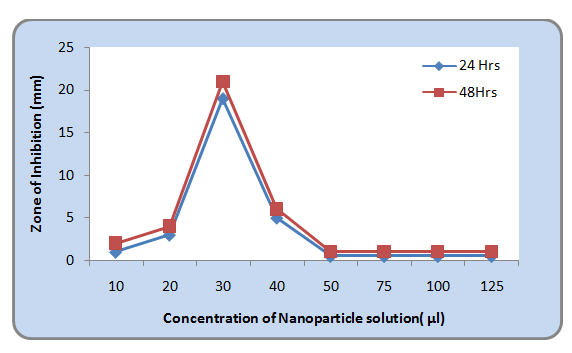 The maximum inhibition of antimicrobial activity of silver nanoparticle coated in PET bottles of Tomato from 0th day to 10th day nanoparticle coated showed that 56.83% against E.coli (MTCC40), 67.67 and 87.67% difference against S. enteric (MTCC 3219) & S. dysenteriae (PSGIMSR) respectively. Feng et al. stated that the microbial inhibition is due to effects of silver ions on gram-negative bacteria Escherichia coli, Salmonella & Shigella dysenteriae it was observed that microbial cells exposed to the Ag+ ions poses stress which led to the condensation of DNA. Therefore, these plant extracts of silver nanoparticles could be used as a coating in food packages as a value addition increasing the shelf- life. ©2015 Ramya M. This is an open-access article distributed under the terms of the Creative Commons Attribution License, which permits unrestricted use, distribution, and reproduction in any medium, provided the original author and source are credited. Department of Food Science and Nutrition, Avianshilingam Institute for Home Science and Higher Education for Women, Coimbatore, Tamilnadu, India.